ASOP No. 9, Documentation and Disclosure in Property and Casualty Insurance Ratemaking, Loss Reserving, and Valuations, has been repealed by the ASB. Statement of Principles Regarding Property and Casualty Valuations. In 2002, the ASB repealed Interpretative Opinion 3: Professional Communications of Actuaries when the Board adopted ASOP No. 41, Actuarial Communications, which superseded the guidance of Interpretative Opinion No. 3. ASOP No. 41 is applicable to all areas of actuarial practice and provides guidance with respect to written, electronic, or oral communications. The Casualty Committee of the ASB has reviewed ASOP No. 9 and compared the various sections to ASOP No. 41 as well as the Code of Professional Conduct. The Committee believes that the topics in ASOP No. 9 are adequately covered in ASOP No. 41, other ASOPs, and the Code of Professional Conduct, and concluded that ASOP No. 9 should be repealed. The exposure draft of this repeal document was issued in June 2007 with a comment deadline of August 15, 2007. Seven comment letters were received and were considered in finalizing this repeal document. For a summary of the substantive issues and the reviewers’ responses, please see appendix 2. The ASB reviewed the comment letters in March 2008 and decided to defer repeal of ASOP No. 9 in order to coordinate with the adoption of the ASOP No. 41 revision. The ASB adopted a revised version of ASOP No. 41 in December 2010, effective May 1, 2011. The ASB thanks all who commented on the repeal. The ASB voted in March 2011 to repeal ASOP No. 9 effective for actuarial communications issued on or after May 1, 2011. 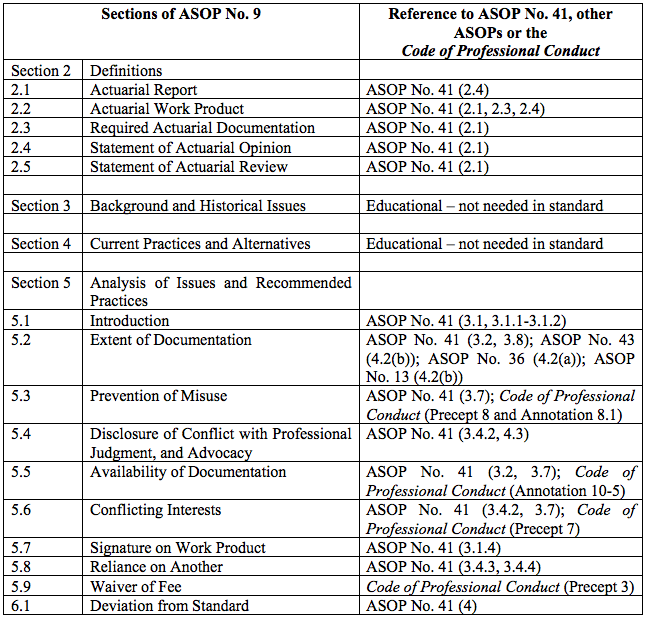 The Casualty Committee prepared the following grid highlighting sections of ASOP No. 9 as a cross reference against ASOP No. 41, Actuarial Communications (effective May 1, 2011), other ASOPs and the Code of Professional Conduct to reflect where appropriate actuarial guidance already exists for the related item or where the item would have been considered educational material and, therefore, not included in any proposed revision other than possibly an appendix. The exposure draft of the repeal of ASOP No. 9, Documentation and Disclosure in Property and Casualty Insurance Ratemaking, Loss Reserving, and Valuations, was issued to the membership in June 2007 with a comment deadline of August 15, 2007. Seven comment letters were received. The Casualty Committee and the ASB carefully considered all comments received.